Gather 'round, kids. I would like to tell you a story. It's the late '90s. Let's say 1998. I live in Chicago, a stone's throw from Wrigley Field, a cosmopolitan's sip from the heart of Boystown (otherwise known as Sidetrack). My third-floor apartment, though a one-bedroom, is so small that the kitchen doesn't have a single drawer. I'm still in the futon stage. The living room wall is festooned with a ceremonial street sign from when they christened my street, Cornelia Ave., "The Jon Simmons Parade." (This sign was much funnier and much more festive before I learned that Jon Simmons was a slain gay activist.) (I loved that sign, though, and still have it.) (No, I didn't steal it. It was $5 at a thrift shop on Halsted and Addison.) Even though my apartment is tiny, I have a wine rack with a built-in bar, copper bowls for mixing egg whites to stiff peaks, and enough room, somehow, to braid a tsoureki. When I'm not at work on W. Wacker overlooking the Chicago River, or watching "Mr. Show with Bob and David" with Sort-Of Boyfriend (who would become Husband seven years later), or belting out showtunes at the aforementioned Sidetrack, I am sitting in that teeny apartment, on the futon, watching the fledgling Food Network, specifically "Taste." "Taste" is the brainchild of the inimitable David Rosengarten, who, it would turn out, was rather imitable in that Alton Brown came along to do the same show, to great effect, with "Good Eats." I digress. The "Taste" episode I'm watching is devoted to croissants, and it is particularly compelling: croissant dough is a laminated dough! Laminating dough is a lengthy process that involves constructing many alternating sheets of dough and butter, which puff during baking to create the flaky layers associated with a good croissant. Who on earth has the time and patience to make such a thing?!?? I wonder. It should be said that I also wonder how it will ever be possible that it will be the year 2000 and I will be twenty-six. I watch the rest of the episode, turn off the TV and head out for the evening, probably with a bottle of sparkling wine or vodka in hand. Wasn't that a great story? I've often thought wistfully of laminated dough since that day. Could I do it? Would it work? Am I crazy? Then, one bright day in 2011 -- bolstered by the intervening decade-plus of cooking and the experience of writing this blog for several years -- I see a croissant recipe in my Baking Illustrated cookbook and realize that laminating dough is actually very simple. I made croissants. They were so easy. They were so amazing. Then I found a recipe for deep-dish pizza with a cornmeal-flecked laminated crust. I made that, too. It was so easy. It was so amazing. Now all I want to do is laminate dough. I suggest you do the same. A note: this recipe allows you do to something called "FORMING THE BUTTER SQUARE." It is fun, and intense. Another, more practical note: this dough needs to be cold when you work with it. Make sure it's thoroughly chilled before you begin rolling it out. If it gets warm or sticky, wrap it in plastic wrap and chill again. Your vigilance will be rewarded. One last note: it helps to have a ruler for this recipe. Embrace your inner massive geek and buy a nice metal one and dedicate it to kitchen use. And finally: this recipe includes the phrase "isosceles triangle." Do not be intimidated. First, make the dough. In a medium bowl, whisk 2 3/4 c. of the flour with the yeast, sugar and salt. Place the milk in the bowl of an electric mixer fitted with the dough hook. Add the flour mixture to the milk and mix at low speed until a ball of dough forms, about 5 minutes. Cut the 2 T. of butter into small pieces and add them to the dough. Continue to knead until the butter is fully incorporated and the dough becomes smooth and clears the sides of the bowl, about 5-6 minutes more. The dough should be sticky, but if more dough is sticking to the sides of the bowl than to itself, add the remaining 1/4 c. flour, 1 T. at a time. Wrap the dough in plastic wrap and refrigerate for 1 hour. While the dough is chilling, have the time of your life while making the BUTTER SQUARE. Using a bench scraper, toss the butter pieces and flour together on a clean work surface. Smear the butter back and forth against the work surface until they combine into a smooth, homogeneous mixture. Wrap the butter mixture in plastic wrap and use the edges of the plastic to form it into an even 7-inch square. Refrigerate the butter square until ready to use, at least 30 minutes. When everything is thoroughly chilled, it's time to make the turns. Lightly dust a work surface with flour. Roll the dough into an 11-inch square. Place the BUTTER SQUARE diagonally on top of the dough. Fold the corners of the dough over the butter so they meet in the middle of the BUTTER SQUARE. Pinch the ends of the dough together to seal. Using a rolling pin, tap the dough from the center outward until the butter begins to soften and become malleable. Gently roll the dough into a 14-inch square, dusting the work surface with flour as necessary to prevent sticking. Fold one outside edge of the dough in toward the center and bring the opposite outside edge in over the top, as if folding a business letter. Repeat the process, but folding over each end to make a square. Congratulations! You have made 2 turns. Wrap the dough in plastic wrap and refrigerate for 2 hours. After 2 hours, make 2 more turns. Remove the dough and place again on a work surface lightly dusted with flour. As before, roll the dough into a 14-inch square. Fold as before: first like a business letter, then folding over each end to make a square. Chill again for at least 2 hours. Now it's time to shape the croissants. Line 2 baking sheets with parchment paper. Place the chilled dough onto a floured surface and gently roll it into a 20-inch square. Using a pizza cutter and your handy ruler, cut the dough into two equal rectangles. Cut each rectangle into thirds width-wise and then into triangles, for a total of 12 triangles. Working one at a time, lift each triangle off the work surface, holding the base in one hand and the tip in the other. Gently stretch it into an isosceles triangle with two sides equal in length. Place the triangle back on the work surface. With the base closest to you, cut a 1-inch slit into the center of the base of the triangle. Fold the two sides of the slit outward. With both hands, roll the triangle from the base, gently stretching the dough as you roll and leaving the last 1/4-inch of the tip unrolled. Transfer the croissant to the prepared baking sheet. Bring the ends of the croissant toward each other to form a crescent shape. Repeat with the remaining triangles. Cover the croissants loosely with plastic wrap and let them rise at room temperature until puffy, 45-60 minutes. They will not double in size. Finally, brush with egg wash and bake. Heat the oven to 400 degrees Fahrenheit. Brush the croissants with the beaten egg. Bake until the croissants are golden brown, about 18 minutes, rotating the baking sheet halfway through the baking time. Cool on a wire rack for about 15 minutes before devouring them all in an embarrassing fashion. Makes 12 croissants, best served fresh out the kitchen. However, they can be kept at room temperature for 2 days. You can also wrap them well in plastic and keep them in the freezer for up to 2 weeks, reheating them from frozen in a 300-degree oven for 5-10 minutes, but I wouldn't know anything about that because I consume all croissants without delay. The first thing my son learned how to do -- the first thing that wasn't instinctive, like eating or crying or turning over -- was feed the dog a treat. Honestly. His first party trick was not to play peekaboo or patty cake or shake a rattle. 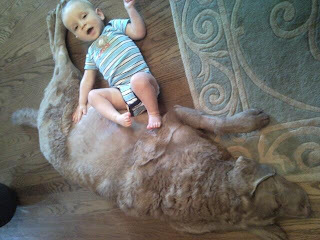 It was to take the Barkwheat handed to him, hold it out patiently and wait for the large Chesapeake Bay Retriever to extract it, gingerly, from his tiny human-paw. I could not be more proud of him, as it is clear that even as a wee tot, he has his priorities squarely in order. So when he began to grow very weary of smoothly-pureed baby food, whether store-bought or prepared at home by me, I felt the least I could do to reward his dog-loving instincts was give him some good quality adult food (or "human food," as Husband calls it, as if babies are somehow not human, which they kind of aren't, but anyway). Somewhere around his first birthday he had started taking a keen interest in our food, reaching plaintively and somewhat pathetically for our plates, whimpering shyly as if quietly pleading, "What is that and why am I not having any and I am so tired of these carrots but I can't talk so please please try to figure it out you losers." Soon his subtle non-verbal requests became outright mutiny, and I realized that if the lad was to eat well, he was going to have to start eating our food. So I wandered out onto the back porch, where a variety of stubborn herbs still thrive, defying this summer's wet and generally crappy garden-growing weather, and cut a massive bouquet of basil, parsley and chives. I mixed together some turkey meatballs, using scads of the finely-chopped fresh herbs as the meatballs' primary flavor. I took more of the herbs and whirred together a pesto, earthy and salty and bright. I cooked some spaghetti. And as I served a bowl of herby spaghetti with herby meatballs to Husband, I took a serving for a spin in the food processor for the baby. I fed him a spoonful; he responded, "Mmmmmmmm" then waved his hands frantically while giggling and smiling. He then gave the dog a meatball. Combine the herbs into a bowl and mix well. Soak the bread in the milk for about 5 minutes, then remove it and lightly squeeze out the milk. Place the bread in a medium bowl, and add the ground turkey, 1 c. of the herb mix and a pinch of salt and pepper. Using your hands, work the mixture until well-combined, adding the remaining milk, if necessary, to form a slightly sticky mixture. Shape into 1-inch meatballs. Heat 2 T. of the olive oil in a large skillet over medium heat until shimmering. Add the meatballs (in batches if necessary) and cook until brown on all sides, about 5-10 minutes. Remove the meatballs to a baking sheet (keep warm in an oven heated to 250 degrees Fahrenheit). Reserve the pan drippings in the skillet. In the meantime, bring a large pot of salted water to a boil and cook the spaghetti according to the package directions until it's al dente. Drain, reserving 1 c. of the pasta cooking water. In a food processor, combine the remaining herbs, 4 T. of the olive oil, garlic, a pinch of salt and pepper and 1/4 c. of the reserved pasta water. Process until pureed, seasoning to taste if necessary. Place the drained pasta into the skillet that you used to cook the meatballs, along with a splash of the reserved pasta cooking water. Add the herb sauce and toss over low heat, adding more pasta water if necessary to make a smooth sauce. Top with meatballs and serve with a generous dusting of Pecorino. Makes 4 servings, but really more like 2 servings. To put it another way, it's enough for two hungry adults, a tot and a Jet.